The aesthetic values of prairie are more subtle than those in many other ecosystems. There is much beauty to be found, but you sometimes have to look for it – it doesn’t often rise up and slap you in the face. That’s especially true in the early spring as the first wildflowers are just starting to bloom. If you had driven past the Platte River Prairies this week, you would have likely dismissed them as a lot of brown grass with a little green grass here and there. Blah. But if you’d gotten out of the car and taken a walk – and if you had been especially observant – you might (MIGHT) have spotted one of my favorite wildflowers. Viola rafinesquii is a tiny, beautiful, and easy to miss wildflower. The Nature Conservancy’s Platte River Prairies, Nebraska. 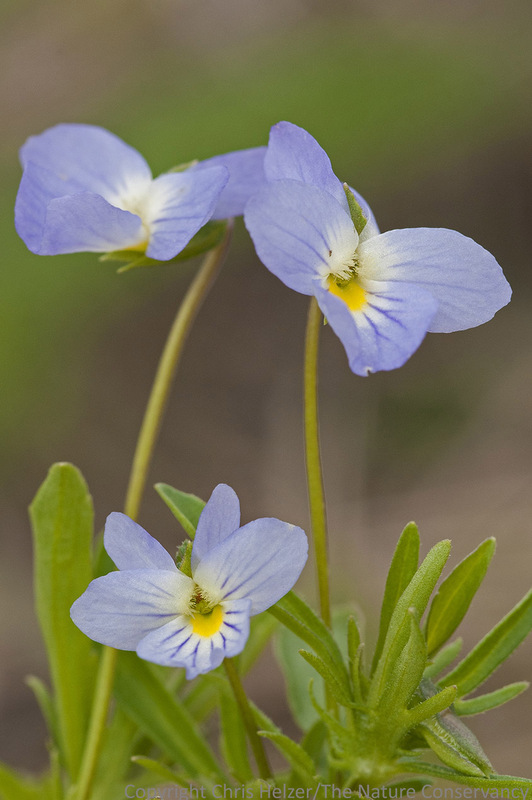 Known variously as field pansy, Johnny Jump-up, and other names, Viola rafinesquii is an annual violet species that makes its appearance in the early spring, just before most better recognized flowers begin to bloom. One a short hike yesterday, the Fellows and I spotted several hundred of these plants, but if we hadn’t been specifically looking for them, we probably would have missed them altogether. The plants stand only a few inches tall, and the diameter of the flowers is about that of a dime. It’s a gorgeous little plant, but you’ve got to get on your hands and knees to really appreciate it. In that way, it’s a pretty good metaphor for prairies in general – if you don’t look closely, you’ll probably miss the beauty altogether. …and that would be a shame. This entry was posted in Prairie Natural History, Prairie Photography, Prairie Plants and tagged annual violet, early spring, flower, grassland, nebraska, prairie, spring wildflower, the nature conservancy, viola rafinesquii, violet, wildflower by Chris Helzer. Bookmark the permalink. Once you pointed them out I found all kinds of them. Need to follow you around more!!! Is this the same species as Viola bicolor? Yes, I think that’s correct. So do you consider this species native? I hear different interpretations. It’s considered to be native to Nebraska. In fact, it has been assigned a “3” for it’s coefficient of conservatism.